This free SkyCiv's Free Moment of Inertia Calculator is able to accurately and quickly calculate the moment of inertia among other section properties. How to use this Moment of Inertia Calculator? To start using the free centroid calculator to calculate moment of inertia, simply choose the cross section you want to evaluate from the drop down list, then enter in the dimensions and click Calculate. The results for centroid, moment of inertia, statical moment section modulus and torsion constant will display on your right. To access the full functionalities of SkyCiv Structural Analysis Software, check out our professional plans. We have flexible plan options that tailor to different needs. 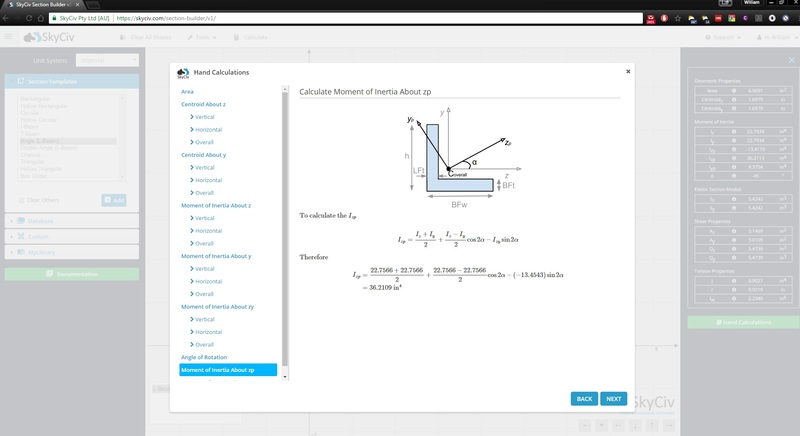 SkyCiv shows you how to calculate the moment of inertia by showing the step-by-step moment of inertia equations and calculations... The also show centroid and area calculations. SkyCiv Section Builder uses FEA to calculate key section properties, allowing you to model anything you need. Simply upgrade and get access to powerful software. 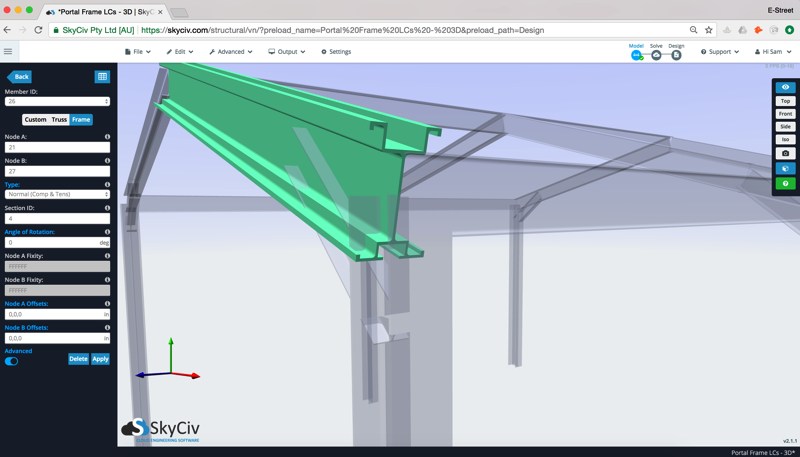 The SkyCiv Section Builder is fully integrated with all SkyCiv Analysis Software including SkyCiv Beam and SkyCiv Structural 3D - so you can analyze your section under loads. This simple, easy-to-use moment of inertia calculator will find moment of inertia for a circle, rectangle, hollow rectangular section (HSS), hollow circular section, triangle, I-Beam, T-Beam, L-Sections (angles) and channel sections, as well as centroid, section modulus and many more results. You can solve up to three sections before you're required to sign up for a free account - which also gives you access to more software and results. For instance, if you're looking how to calculate the moment of inertia of a rectangle you can use the tool above simply by selecting rectangle from the drop down list then entering some dimensions for height and width (e.g. 100, 200). After clicking "Calculate", the tool will calculate the moment of inertia. Our paid version will show the full hand calculations of how the tool got to this result. These detailed step-by-step instructions help for you to follow the calculations and learn how to calculate the moment of inertia. Alternatively, we have a tutorial on how to find moment of inertia. The calculator will also produce results like section modulus (Z) and the statical moment of inertia (Q) for your sections. Finally, the result for Torsion Constant (J) will also display using this tool. The SkyCiv Section Builder will also produce these results accurately using FEA analysis of the cross section. So if you need more results, or to add custom shapes - please check out our extra functionality of the SkyCiv Section Builder. SkyCiv also offers other tools such as I beam size tool and free structural design software. The dynamic section drawer will also show you a graphical representation of your beam section. So if you want to calculate the moment of inertia of a circle, moment of inertia of a rectangle or any other shapes, feel free to use the below software or our all-inclusive SkyCiv Section Builder. 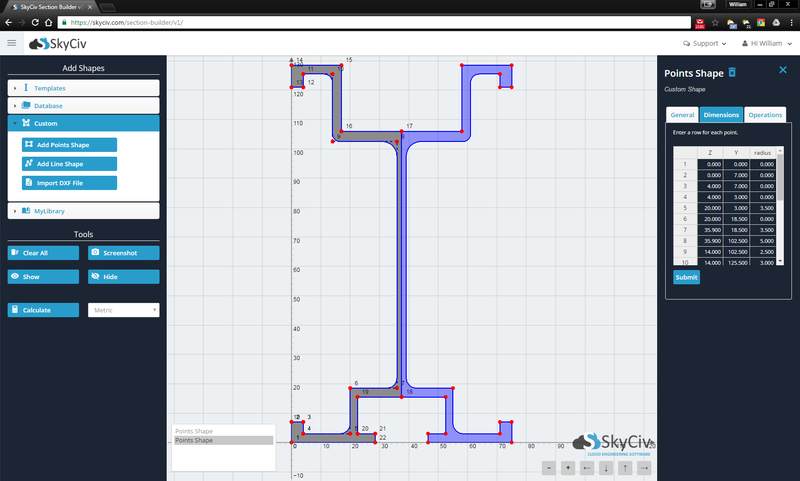 SkyCiv offers a wide range of Cloud Structural Analysis and Design Software for engineers. As a constantly evolving tech company, we're committed to innovating and challenging existing workflows to save engineers time in their work processes and designs.